Since the end of September we have noticed a significant slowing of the pace at which people have been flowing in and out of our front lobby; there seems to be quite a bit of lingering. 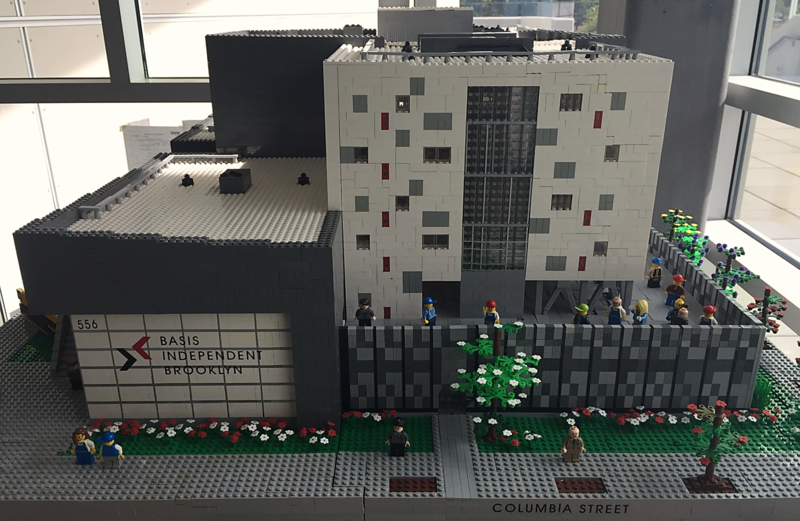 While our friendly security and front office staff are enough reason to hang around, what is stopping people in their tracks is the presence of a scale replica of our schoolhouse made entirely of Legos! Down to the trees and the fencing detail, the model is an exact replica of our beloved schoolhouse at 556 Columbia Street. It is not only impressive, but downright cool. The model was actually completed around the start of our inaugural school year but we kept it under wraps until now. 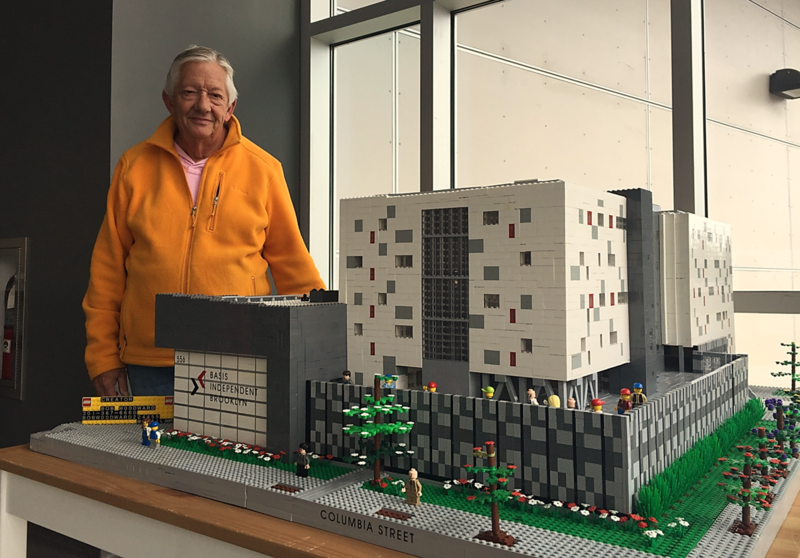 I sat down with Bob Woodward, Lego Artist and proud BASIS Independent Brooklyn grandfather of Ella M. in the 3rd grade to get the story of how his creation came to life. Alexandra Hancock (AH): This is pretty astounding, Bob. 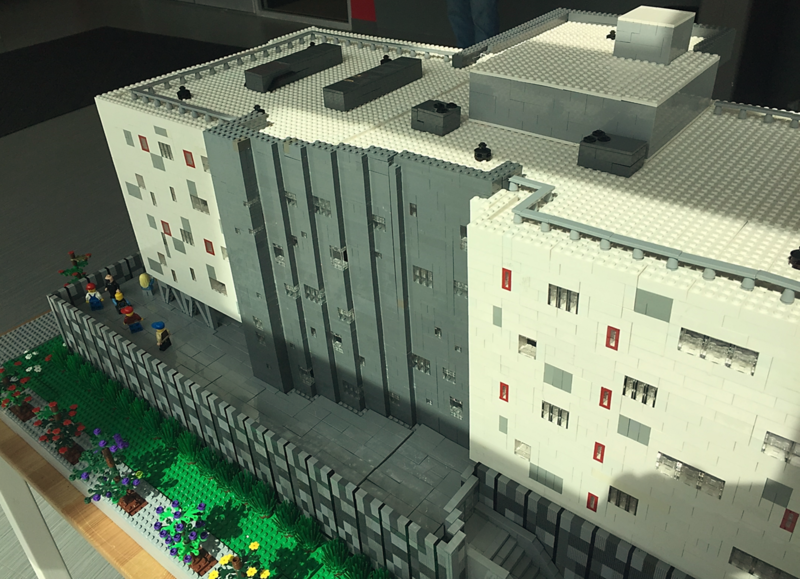 How long have you been a Lego artist? Bob Woodward (BW): About 6 years now. AH: Wow! That’s not so long for a structure this impressive. What are the stats on the model? AH: What was the hardest part? BW: The glass was the hardest part. It had to be upside down within the structure. All of the window panes were also a challenge. AH: Where did you begin? What was your process? The first thing I did was take the drawings from Carhuff and Cueva (the architects), run them to scale at Kinkos. I then literally laid our Legos along the drawings to get a sense for size. I spoke a lot to the architects and went out to Ephraim, PA to visit the building modules under construction. Once you have the drawings it’s easy. AH: Easy?! Nothing about this model seems “easy” to put together! Given that you are so close to the building, having truly “built” it in a certain capacity, what are your impressions? BW: I believe it is a beautiful building. The most unique element of this school is the outside design. The variation on the architecture on the windows is fantastic. Nothing is boring about it. As people are across the street and see this building, they really mustn’t be able to take their eyes off of it. Internally, the classroom sizes are great, there's really no other building like this. We agree, Bob! It sure is a beautiful building. Thank you for all your hard work bringing our school to life in such a unique, interesting way. Read more about the design of our school and how it relates to our philosophy here.